/Scone- ina/ is roughly how you pronounce Jeff’s last name. 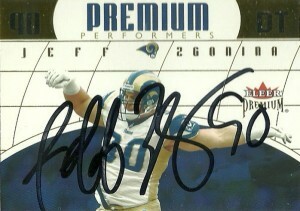 An ironman journeyman Jeff Zgonina played in the NFL from 1993 to 2009, -or roughly 17 seasons for 7 teams. At 6-2, 285 he played on the interior line as both a NT and a change of pace DT. Zgonina would play on the St. Louis Rams’ Super Bowl teams, after bouncing around, but would find his final home with the Houston Texans where he finished out his career after a short stint in Miami. (Zgonina was a fringe player who found himself frequently on the cusp of the final cut, or called back a week later when more room was made and despite his age, didn’t have as much wear on his tires as people thought.) Zgonina will be best remembered by Houston Texans’ fans for when he recovered a Kerry Collins freak fumble against the Titans in 2009 for a victory. An outspoken member in the locker room, players could expect to hear the straight up truth from Jeff, and he provided guidance for the younger members of the defensive line. Chris Brown has been a highly touted runningback at every level he’s played. 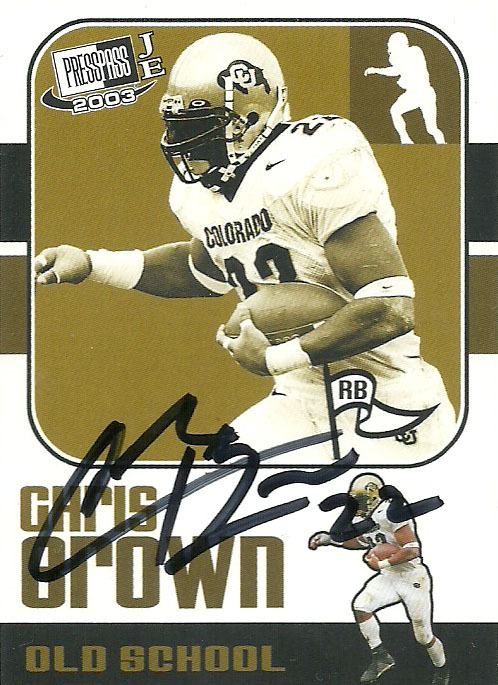 In college for Colorado he broke many of the school’s rushing records and had a shot at the Heisman that year, but injury derailed his attempts and he decided to declare for the NFL draft as a Junior in 2003. Brown surprisingly lasted till the third round that year, where the Tennessee Titans looking for help at that position drafted him. Brown’s running style has always been a source of controversy and concern, as he has a ‘straight up’ slasher running style (like that of Eric Dickerson). Scouts felt that he would be prone to fumbling and also injury- and for the most part, they were right as Brown never played a whole 16 game slate over his career, sitting out all of 2008. Brown was cut by the Titans in 2008 and signed with the Texans that year, who were looking to add depth to their running backs and needing a ‘big back’ to compliment young scatback Steve Slaton. After fumbling the ball away in a 2009 game, he got what I call ‘Sammie Smith-itis’ and seemed to lose confidence holding onto the football. At 6-3, 219 he never really got comfortable in the role as a goal line short yardage back for the team, and the Texans decided to go in another direction in 2010, electing not to resign him. I have always been a fan of Chris- and felt that he had gotten a bad rap at his stops in Tennessee and Houston as a fumbler. (14 fumbles over his career.) He has had his shares of extreme ups and downs, and during the 2004 season he single-handedly crushed the Green Bay Packers in primetime, helping me win in fantasy football, (as I got lucky starting him that week,) rushing for 148 yards and 2 touchdowns. He wasn’t a bad receiver out of the backfield either grabbing 90 catches over 6 seasons and Brown had 1900 rushing yards over 26 a game period. 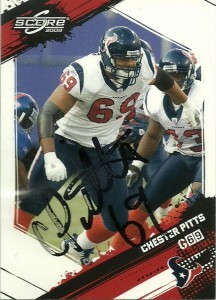 I got Chris’ autograph as part of the ‘Texans Blitz’ through my friend’s brother who plays for the team. 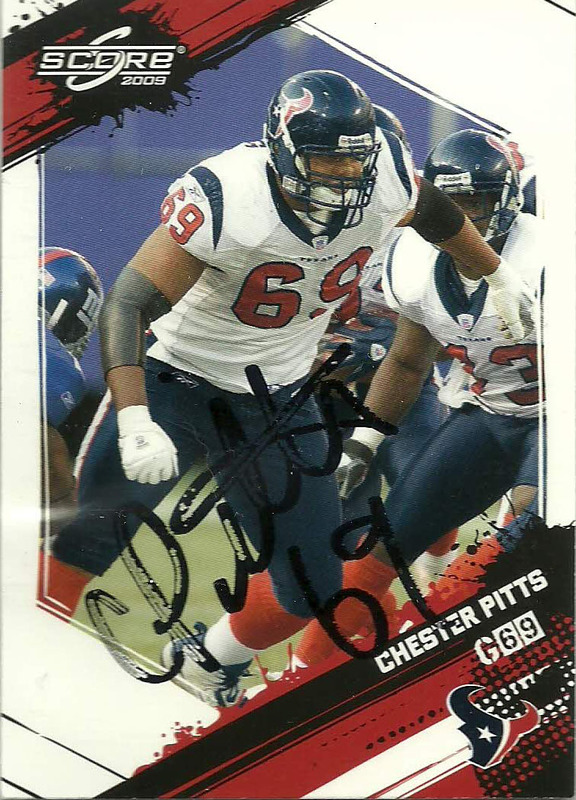 Chester Pitts was a 2nd round choice of the Houston Texans inaugural draft in 2002. He was one of 2 remaining ‘original’ Texans (Kris Brown being the other) remaining on the team roster as of 2009 and started 114 games in a row for the franchise first as a left tackle and then settling in at left guard. On a horrendous offensive line, Pitts provided key stability, consistency, and flexibility, in a variety of offensive systems playing for the Texans. Unfortunately in 2009 Pitts was playing in the final year of his contract. In the third game of the season he suffered a catastrophic knee injury and was unable to return to the lineup for the remainder of the season. The Texans took a wait and see approach to Pitts rehabilitation, but despite his efforts at rehabilitation, elected not to resign him where as he hit the free agent market and signed with the Seahawks before training camp in 2010. Pitts was the focus of a Superbowl XLII commercial relating to how his career began which starred him and Ephraim Salaam, (who takes credit for ‘discovering’ Pitts bagging groceries at a local Ralph’s supermarket). Pitts is incredibly strong, and is a world class shotputter holding still many records at his alma matter San Diego State. He is also an accomplished oboest.